This log-and-stone style cabin is located high in the Blue Ridge mountains at around 3,000 feet elevation. It is in the same area as the Shenandoah National Forest and this property borders the park land. You will not find a more private or mountainous cabin to stay at than this one. You will not see another human being for a half mile in any direction, but you'll see plenty of deer, bear and wildlife! Inside the cabin, you'll find spacious living areas, comfortable bedrooms, a fully stocked kitchen and large HD televisions. When you look up "remote getaway" in the dictionary, there's a picture of this cabin! :-) Come to rest, relax, have fun and take pleasure in nature's finest wonders. Leave business, nagging email and your hectic work schedule behind for something quiet, peaceful and relaxing! We've recently worked on filling out the beautiful outdoor area beside the cabin with a large campfire pit, firewood (stacked and ready for you, look at pics) and hot tub. This yard area has beautiful views of nature. This cabin is located "up Tanner's Ridge" as the locals say. In the pictures, you'll see two pictures showing the beautiful overlooks and mountains that you see as you drive to and from the cabin. You'll want to stop and get your own pictures on the drive. PLEASE NOTE for January - March bookings: During these winter months, we strongly advise that a four-wheel drive (4WD) or all-wheel drive (AWD) vehicle is required. While there are plenty of dry weekends during those months where a regular vehicle would be fine, you cannot know that in advance. Please take this warning seriously for those months. The rest of the year, regular 2wd vehicles are fine. Powered By OwnerRez - vacation rental software! 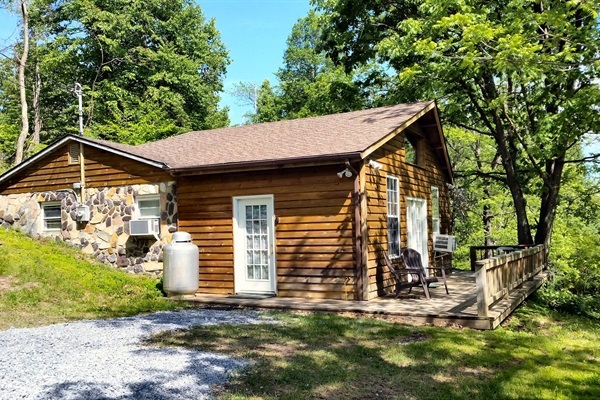 © 2008-2019 Shenandoah Cabin Rentals.